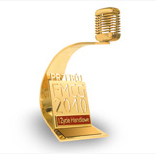 In 2013, our company received an award in a competition organised by the Wiadomości Handlowe magazine, “Perły Rynku FMCG 2013” (Pearls of the FMCG Market 2013) in the category of non-food products for children. Producers and distrbutors submitted more than 400 products in 64 food, chemical and cosmetic, and service categories for the seventh edition of the competition. Owners and employees of shops around Poland pointed out the products that should receive the market "Pearls", as being attractive both for the consumers and the retailers. The award was granted to Kindii New Baby Care product: wipes that were designed for the most delicate skin of newborns and that were launched in 2012. FMCG Top Products is a national prestigious competition aiming to identify the best products that hit the retail market in Poland every year. 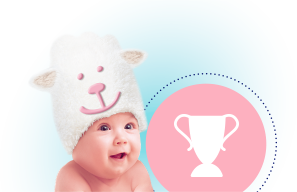 In a 2010 edition of the competition our Cleanic Kindii Baby Wipes with a new, improved formula were awarded a prize in the category “Baby wet wipes”. This year FMCG Top Products competition celebrates its sixth edition which was announced by a magazine “Commercial Life” [Życie Handlowe]. The contest has been very popular for several years now and, judging by the number of incoming applications, it is highly recognized by Polish retailers. In this year’s edition producers and distributors sent 180 applications to have their products rated. The products were rated by a jury of 10 members at the first stage, and at the second stage by retailers casting their votes at portalfmcg.pl. This year, FMCG assessment committee had to choose among 1400 retail offers. The baby cosmetics series Cleanic Baby won the second prize in a prestigeous competition announced by a magazine “Cosmetic News” [Wiadomości Kosmetyczne] in the category “Baby cosmetics”. The contest was organized for the third time and its purpose was to rate the best cosmetic products which entered the Polish market in 2008. The cosmetics were rated by the readers of the magazine “Cosmetic News” and by individual cosmetic shops’ owners and wholesailers. This award is a particularly valuable distinction, since it was granted by the specialists in cosmetics industry and analysts of the cosmetic market in Poland. The competition was very high – as many as 170 products were rated in 17 different categories – thank you very much for casting your vote for our Cleanic Baby brand! 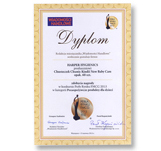 In January 2008 the Product of the Year competition was announced by “I have a Child” magazine [Mam Dziecko]. Kindii cosmetics brand was awarded three times. The first statuette in the category “Cosmetics for mums” (“Skin care” subcategory) was awarded to Cleanic pre-moistened make-up remover pads and to our Cleanic peeling facial wipes Clean O’Peel. The winner in the category “Baby and Parent cosmetics accessories” (subcategory “Wipes”) were Cleanic Baby skin care wipes. The Product of the Year plebiscite has been organized by “I have a Child” magazine for five years. The jury rating the brands is made of the specialists who represent various health care institutions, for example The Children’s Memorial Health Institute and The Research Institute of Mother and Child. The magazine’s editorial board and parents also take part in the voting. In November 2007, our product Kindii Skin Balance was awarded the first prize in “Your Baby’s Favourite Product” competition in the category “Baby wet wipes”. The contest was organized by the editorial board of the magazine “Your Tiny Toddler” [Twój Maluszek]. We owe this honour to all Mothers who decided to take part in an SMS contest and sent SMSes to vote for our product. They recommended Kindii Skin Balance wipes as their babies’ favourite wipes. This product came first among eight other brands nominated for the contest. A BIG Thank You to all Mums!